novaPDF 8 was now released and is available for download. An important part of it was completely redesigned thus we highly recommend the upgrade. You can download it here: Download novaPDF. Completely redesigned interface and WYSIWYG layout. novaPDF now has a new layout and was completely redesigned to offer a better organized and cleaner look. The printer driver now only offers 2 tabs with the minimum information you need to create the PDF, for when you want to do simply just that. The advanced options were all moved in a separate section of novaPDF called “Profile Manager”, where not only that you can define printing profiles but also create predefined presets for the options used in those profiles. We’ve also introduced an WYSIWYG layout for managing watermarks and signatures. Possibility to add different print queues and ports. With the previous version of novaPDF you could only install and have a single virtual PDF printer based on the conversion driver. Now, with version 8, you can add multiple virtual PDF printers all based on the same novaPDF print driver. You can even name the virtual PDF printers anything you want and that’s how they will show up in your list of “Devices and Printers”. The main advantage of having multiple PDF printers is that you will have a different print queue for each. This means that you can for instance have one of the printers shared as a PDF server while another locally and both could have their own printing queue and creating separate sets of PDFs. PDF Linearization. Also called fast web view, PDF linearization allows the creation of PDF files that can be easily viewed via the web browser. Instead of downloading the entire PDF file at once, the PDF will be “streamed” in the browser page-by-page. This is useful when you want to load a PDF file online on your website and want to deliver it to your viewers as fast as possible. This way, even if you upload a large PDF file (xxMb), your viewers will see a page only after downloading a few kilobytes instead of waiting for the full extra megabytes. Create PDF/A-1a and PDF/A-1b compliant PDF files. PDF/A is a PDF file format used for long-term archiving of documents in electronic format. It uses PDF Reference 1.4 (implemented in Adobe Acrobat 5) and complies with the ISO Standard – ISO 19005-1:2005. PDF/A-1b was included in novaPDF 7 too, but version 8 brings also compliance with PDF/A-1a specifications (level A compliance in Part 1). This includes all requirements of PDF/A-1b and additionally requires: document structure to be included, tagged PDF, Unicode character maps and language specifications. 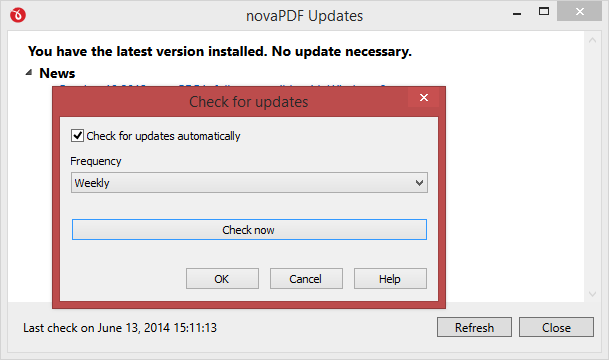 So starting with version 8, novaPDF is fully PDF/A compliant. 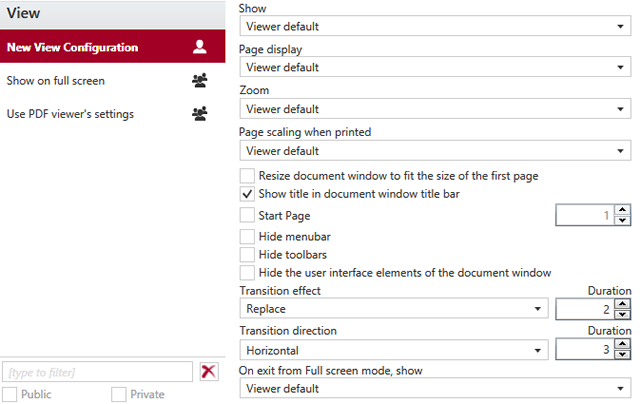 Extended PDF view options. 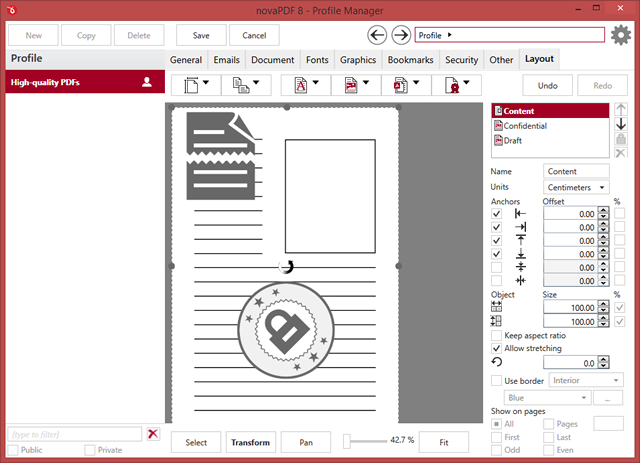 novaPDF allows you to define how the PDF will be opened and handled by the PDF viewer after it was created. The new version lets you take advantage of many features included in the PDF viewer such as transition effects or the possibility to hide menubar/toolbars/user interface elements. This gives you total control over how the PDF will be opened and handled in the PDF viewer. Driver certification for Windows 7 / 8. Starting with version 8, novaPDF passed the driver certification test from Microsoft for Windows 8 and 7. All drivers running on 64-bit versions of Windows must be signed before Windows will load them so now novaPDF has a digital signature associated. During installation Windows uses digital signatures to verify the integrity of driver packages and to verify the identity of the software publisher who provides the driver packages. This lets you know if the novaPDF setup you received is really the one released by us, as otherwise Windows will show you a warning. Predefined SMTP servers. novaPDF Professional can send emails after the resulting PDF was generated. The email can be sent using the regular email client or using an SMTP server. 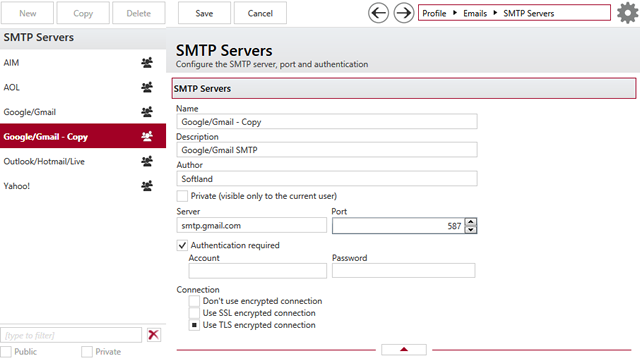 In version 8 we’ve added several predefined SMTP configurations for popular email providers: AIM, AOL, Gmail, Outlook/Hotmail/Live and Yahoo. Using these you can create your own SMTP configuration and you only have to add an username and a password to use it. New image watermark presets. With novaPDF you can use images as watermarks in the resulting PDF file. 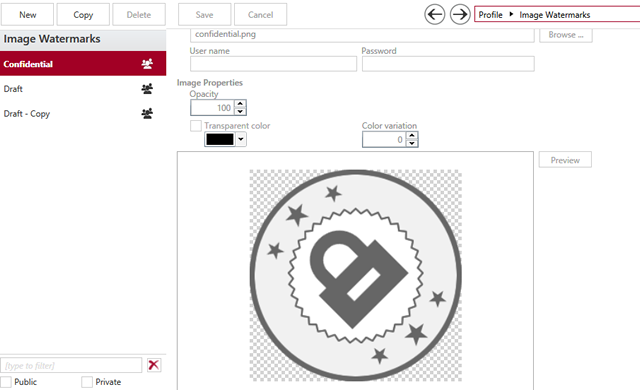 Version 8 brings three preset image watermarks to be used for specific types of documents: confidential, draft or place-holder. Image watermarks will increase the size of the resulting PDF file, so these should be used only when watermarking is necessary. Included text watermark templates. Starting with version 8 you can also add predefined text watermarks to generated PDFs. This way you can mark each page in a PDF with the page index/count, date/time, or specific text (i.e. confidential, draft). Predefined templates for overlays. novaPDF Professional lets you use other PDF files as the background/foreground content in the PDF you are generating with overlays. You can basically overlay an existing PDF to the one being generated when image watermarks are not the solution. Version 8 offers now three predefined templates: generic, invoice and letterhead. These are meant as an example to see how you can use overlays to generate automatically invoices or brand your official documents. New predefined signatures. The new version also includes predefined templates for signature, thus with version 8 you can add one of these presets: basic signature, generic signature or sample signature. You can always use your own custom signature, but also the default ones if they fit the purpose of the PDF you are generating. Automatic updates. With the release of version 8 novaPDF is able to check for updates automatically and notify you when a new release is available so that you can download and install it. This allows you to be sure that you have the latest updates installed as soon as they are released. Of course that you can also disable the check for updates if you want to do it manually. Online account. By creating an account online via https://secure.novapdf.com you can access your orders and manage your profile, products and keys. If you have ordered in the past you’ll be able to claim your keys from previous orders and associate them with your account. Lastly, there’s a contact option that will send us also the information related to your account and this way we’ll be able to answer your questions faster. Lots of other smaller features were added or updated as this release is one of the most important updates for novaPDF in the recent years. We strongly recommend updating to this version and the good part is that you can give it a try before deciding to make the switch. novaPDF 8 will install separately from your older installation and you can test it for 30 days: Download novaPDF 8. When you’re ready to make the switch, just purchase an upgrade. Prices for upgrades vary depending on what license you currently own, but you can quickly check the pricing by entering your key here: Upgrade to novaPDF 8.